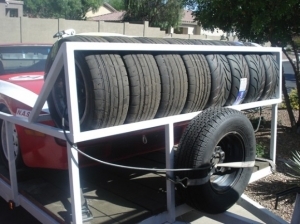 Homemade trailer tire rack constructed from angle iron and intended to fit on an automotive hauler. Holds two spare sets of tires, plus the trailer's own spare. Using this system, you can bring 3 sets to the track. Should cover most conditions for the weekend.